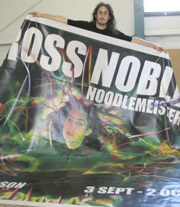 Talking of comedy eBay auctions, Ross Noble is auctioning off this massive – and we do mean massive – poster of his Noodlemeister tour for charity here; while Scottish stand-up Janey Godley is flogging a painting she created for Arthur Smith’s Arthurart exhibition here. Bids currently stand at £200. Bob Mills' stepmother dubbed the voice of Tripitaka in Monkey. Stand-up Paul Thorne got whacked in the head on stage this week – by another act. Newcomer Solomon Anker was taking part in the notoriously brutal gong show at London’s Comedy Store on Monday, and didn’t take too well to being voted off by the braying audience. He wouldn’t leave the stage, even when his microphone was turned off, and tried to use compere Thorne’s to keep talking. When he said no, Anker slapped him across the back of the head, sparking what one witness called ‘mayhem involving bouncers’. Don’t expect to see Abker headlining the Store for a while yet. Paul O'Grady is learning to thatch roofs. Ed Byrne is running the Dublin marathon next month. Click here to sponsor him. Scottish comic Karen Dunbar always carries a ‘gratitude stone’ with her – she says it’s basically ‘a wee stone that I picked up from my front drive. Each time I touch it when I go into my bag, I remind myself to be grateful for something’.